The Strata-Sphere » Was Obama Forced Into Action On Osama Bin Laden? Was Obama Forced Into Action On Osama Bin Laden? Nothing wrong with a bit of caution here, don’t want to destroy an innocent family hiding out in a fortress. But from August to February? Seems – as usual – team Obama wanted proof-perfect before acting. Anyway, I am not going to nit pick caution. My guess is the intel kept mounting and overcame a lot of internal hesitation inside this hesitant White House. Sources tell ABC News that in March President Obama authorized a plan for the U.S. to bomb Osama bin Laden’s Abbottabad compound with two B2 stealth bombers dropping a few dozen 2,000-pound JDAMs (Joint Direct Attack Munitions) on the compound. But when the president heard the compound would be reduced to rubble he changed his mind. … First off, the  B-2s with 24+ 2,000 lb JDAMS is overkill. You could attack a small city with that kind of ordnance. And I don’t know if a ‘few dozen’ is two  or more dozen. This is the proverbial M1 tank used against the gnat. What struck me about this was the amazing amount ignorance one found in this little footnote to history. I go on in that previous post to prove my suspicions, given the destructive power of a 2,000 lb bomb and the tiny size of the compound. It was as if some naive propaganda agent had cobbled together this bit of revised history to cover up something. It does not take two B-2’s with 24+ 2k JDAMS to take out a house. I remained completely flummoxed and suspicious about this deliberately leaked detail. It did not fit the rest of the narrative, and appeared irrelevant. Why was this fabricated detail added to the history by someone clearly unfamiliar with weapon platforms and ordnance yields? Now add in some more of the narrative – like the fact we had concluded in August 2010 the compound housed Bin Laden, yet spent 6 months trying to make 100% sure he was there. Why the hesitation? Why authorize a ridiculous and reckless bombing run in March, then order it stopped, and then agonize for days over a precision strike force in April? My experience with the intelligence and military thinking precludes this kind of see-saw thinking AFTER a decision has been made. First off, we know there were 5 high level meetings during this time period on this topic. Thursday was not THE FIRST time Panetta was in talking confidence levels. Clearly he had to talk confidence levels for the March indecision, and probably did for months leading up to this point. Once again, a suspect narrative appears. No intelligence is going to be perfect and there were naysayers with I guess valid concerns (did not want a Carter-style blown rescue mission or a Clinton-style Black Hawk Down). But which side was the President on? Was he holding out for perfection? Was he unwilling to take out Bin Laden and held his ground for almost 6 months against the recommendations of his intelligence team? But the president stunned officials when he told a national security meeting that he wanted more time to think – and disappeared out of the room. The head of the CIA and other senior intelligence officers who were keen to proceed were left tense as they waited for the president’s decision. But the next morning after 16 hours, Obama summoned four top aides to the White House Diplomatic Room. Before they could speak, the president put his fist on the table and declared ‘It’s a go’. Sounds a bit strained. Again I note a bit of the theater here with the fist pounding element in the narrative, and the President making a declaration before anyone could talk. Again, I cannot help but feel this story is a rewrite, a bit of propaganda surrounding events that played out differently. Here the evidence was overwhelming on Thursday – yet the President hesitated (this would be the 2nd time in two months, if we believe the March indecision narrative). Finally, I could not help but note President Obama was not very jovial or upbeat over this news. His Sunday night press conference oozed tension and stress. There was no sign of celebration, no smile. Even the photo of President Obama straight off the golf course watching the raid in real time seems to indicate someone anxious and unhappy, not resolute and confident (click to enlarge). Heck, the President is not even sitting at the head of the table, supposedly in charge. He is on the sideline! So why am I bringing all this up during a time of national celebration? Am I hunting for a dark cloud amongst all this silver lining? I was worried about that, which is why I toned down my suspicions since Monday. Note: This communication came from our long time D.C. Insider and details previous and ongoing conflicts surrounding the decision to assassinate terrorist Osama Bin Laden. Significant push to take him out months ago. Senior WH staff resisted. This was cause of much strain between HC [Hillary Clinton] and Obama/Jarrett. HC and LP [Leon Panetta] were in constant communication over matter – both attempted to convince administration to act. Administration feared failure and resulting negative impact on president. Intel disgusted over politics over national security. Staff resigned/left. Check timeline to corroborate. Now THIS seems to fit the established MO of this White House. A White House that banned the term “War On Terror”. A White House that resisted calling the Ft Hood Massacre and Christmas Day Bomber attempt terrorist acts. A White House that pulled back on our monitoring of suspected attacks. A White House that preferred Miranda Rights over interrogation. The fist pounding only comes from this President when he wants to save Obamacare or defend high gas prices. IMPORTANT SPECIFIC: When 48 hour go order issued, CoC was told, not requested. Administration scrambled to abort. That order was overruled. …Independent military contacts have confirmed. Stories corroborate one another. This is legit. Emphasis in original. So, is this why a story was concocted about a March raid with two B-2’s and 24+ 2k JDAMS? As I said, the number of JDAMS shows complete ignorance and you would not use a B-2 when am F117 stealth fighter could do the trick. Was this cover for the effort to abort the raid that succeeded? This story can be confirmed to some level – through the resignations of key people. This, sadly, makes sense. 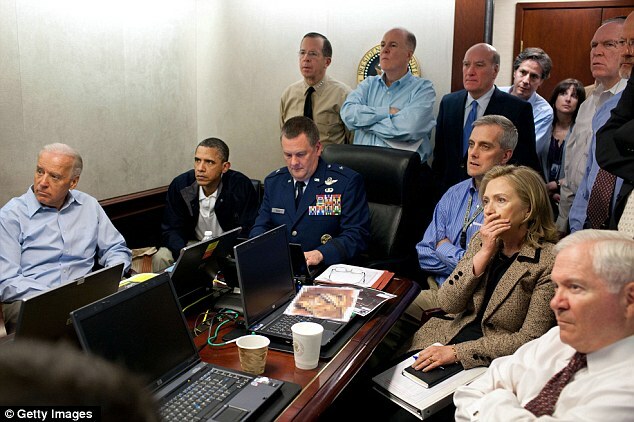 Can you see Hillary Clinton reliving the hesitation of her husband’s opportunities to take out Bin Laden? If President Clinton had gotten over his fears, we might not have had a 9-11. That had to be what drove Clinton and Panetta and others to take action before they lost Bin Laden again. If this is true, President Obama is in serious political trouble. And I hate to say it, this has all the signs of two factions warring in the government (see this all the time, up close and personal). One side is covering their trail while the other is celebrating. If this does break open, it will be amazing to witness. Every time military and intelligence officials appeared to make progress in forming a position, Jarrett would intervene and the stalling would begin again. Hillary started the ball really rolling as far as pressuring Obama began, but it was Panetta and Petraeus who ultimately pushed Obama to finally act – sort of. Panetta was receiving significant reports from both his direct CIA sources, as well as Petraeus-originating Intel. Petraeus was threatening to act on his own via a bombing attack. Panetta reported back to the president that a bombing of the compound would result in successful killing of Osama Bin Laden, and little risk to American lives. Initially, as he had done before, the President indicated a willingness to act. But once again, Jarrett intervened, convincing the president that innocent Pakistani lives could be lost in such a bombing attack, and Obama would be left attempting to explain Panetta’s failed policy. Again Obama hesitated – this time openly delaying further meetings to discuss the issue with Panetta. Looks like the fantasy narrative came from the Jarret side of the WH. As I suspected, that fantastically exaggerated story about a March bombing was meant to hide the truth. The truth of a paralyzed and impotent White House that could not bring itself to take out the world’s most notorious terrorist and mass murderer of Americans sitting still, like a fish at the bottom of a dry barrel. Pathetic. This insulation ended at some point with an abort order that I believe originated from Valerie Jarrett’s office, and was then followed up by President Obama. Jarrett and Obama DID try and stop the raid on Osama Bin Laden. If proven, the President’s career is over. The operation was at this time effectively unknown to President Barack Obama or Valerie Jarrett and it remained that way until AFTER it had already been initiated. President Obama was literally pulled from a golf outing and escorted back to the White House to be informed of the mission. How embarrassing. Whoever snapped that shot and let it out just confirmed all of this. Anyone watch the debate? I watched parts of it. BTW, Drudgereport indicates that Ron Paul raised 1 million in one day!